At VIP To Go we want to be your disaster planning partner and your wedding porta potty partner. Whatever you need, we want to be there. We’ve worked with FEMA and various municipalities to provide their disaster planning and relief needs, and we can be there for you. Whether you need a basic, two stall Restroom Trailer for a wedding or other event, or a huge supply of trailers to handle a disaster, we have you covered. We also rent wedding porta potty units and trailers for other events. When we rent you a wedding porta potty restroom trailer, or a trailer for any reason, we ensure that everything is all part of a single quote, including delivery, set-up, and pick-up, as well as maintenance, if you request it. If we quote you as a national organization or company, as we have done with many large, national chains, you get the convenience of a single price and point of contact, no matter where in the country you need your trailer. With VIP TO GO it is all about you, the customer, and how we can serve you best. 1. VIP To Go is there for you, day and night. At VIP To Go we know that if you are looking for a restroom trailer for a wedding, you can call during regular business hours. But if you just experienced a disaster, then time is of the essence. That is why VIP To Go ensures that all their top leadership are in touch, day and night, via blackberries and other communications technology. When you leave an important phone message or email with VIP To Go that message will be routed to someone of authority, even at 2am, and your call will be answered within an hour, if it is an emergency situation. 2. VIP To Go is customer focused, with exceptional quality and service. At VIP To Go we are a business, of course, and as such we seek to make a profit. But we believe that each time we serve a customer it is not their money we are thinking of. Instead, we see each customer as an opportunity to demonstrate our excellence, build good word of mouth, and continue to grow our business. This means that you always get our best effort, our most responsive actions, and our highest quality trailers, every time. At VIP To Go we know that we have the best restroom trailers in the nation. This applies to both our luxurious models and our simpler models. How can we make such a bold statement? Because we are the only company that we know of that replaces our trailers every 12-18 months. That’s right – when you rent a restroom trailer from VIP To Go you will never get a trailer that is more than 18 months old. Why? Because we want to ensure that every time you rent you have the best, cleanest, most efficient restroom trailers possible. 4. VIP To Go has enough trailers to meet all your needs. Bigger may not always be better, but when you have a big need for a lot of restroom and shower trailers, size matters. At VIP To Go we have the stock and selection of trailers that you need to get the job done. Call VIP To Go today to talk about how we can be part of your wedding porta potty planning or disaster management plan today. This clean and simple trailer offers 2 private rooms, each with a shower, toilet and sink,can serve up to 20 workers in a 40 hour work week or 75 guests for up to 10 hours. 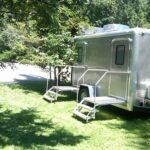 Shower trailers for rent offer a variety of amenities and can save you nearly $60,000 over building a new shower room.